National parks have always been great places to visit any season of the year, but some national parks are better visited during the fall. 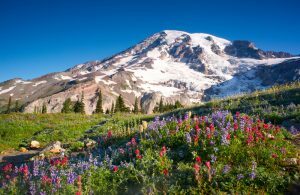 At this particular time of the season, most National parks are at the peak of their blooming stage. The serenity and the lovely environment becomes a gem one must have at least a glimpse of even if it’s going to be for some seconds. At most of these parks, you will get to view the glamour in the activities of the cold weather on them. Therefore, it’s best you try as much as possible to know the route of any National Park you will be visiting this fall. If you are looking for a park to visit this fall, below are few National Parks you must visit this fall. 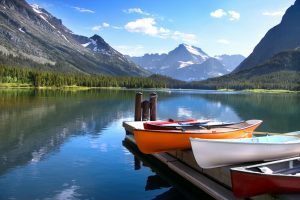 The Glacier National Park at Montana is visited by the tourist who loves active wild and fewer crowds during autumn. 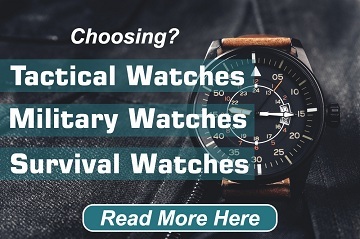 So, if you are visiting during the fall, it’s expected that you will be self-sufficient. The trees located in the west region of the park, change colors around mid-September, while the trees at the eastern part of the park are filled with more fall colors, mostly when September is about to end and also in the first week of October. The final color change occurs in mid-month of September, then the color change in larch trees becomes golden. Although, it’s a fantastic place to visit in the fall, it’s also quite an impressive place, and even spectacular when its earthly spire is icy. 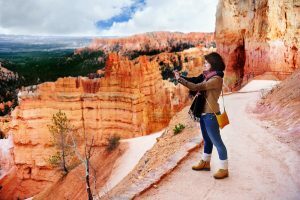 The Bryce Canyon Park at Utah is one of the most notable and precise locations for sky stargazing. The astronomy and full moon adventure programs are part of the incredible programs lined up for various tourist and visitors who interested. Though different dangers pose threats, if the park’s rules and regulations are followed to the latter, then it’s definite that you will be safe and will enjoy your visit. The park located in Maine is called the Acadia National Park, and it’s one of the best national parks to watch the amazing color of the fall. When it’s September, the leaves change to the fall color while in mid-October, the color change is complete and at its peak. 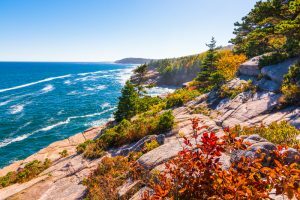 If you are a visitor or a tourist that loves watching birds, sea ducks, prey migrating birds and spring warblers the Acadia National Park is the best location for you. This particular park is a home for various species trees. For several weeks, the Great Smoky Mountains mostly observes a leaf season in autumn as the fall color moves down the sides of the mountain even from the high elevation to the low. The change in color starts as early as in the mid-month of September as it turns the American beech, hobblebush, pin cherry, mountain maple and yellow birch. The fall colors increase over four thousand feet from early October to mid-October. 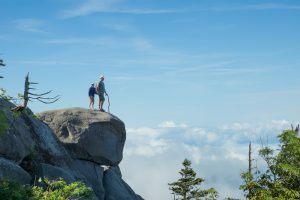 The visitors are allowed drive on the Clingmans Dome, Foothills Parkway or the Blue Ridge Parkway. Between the mid-October and the early part of November, the park displays the magical peculiarity of the fall’s color at the middle and lower elevation. The Washington iconic park is the Mt. Rainer and also known as one of the impressive volcanoes in the world. This unique park centerpiece is the main reason why thousands of tourist and visitors keep coming year after year. The amazing and lovely yellow and orange color of the mountain while peeking from a certain landscape can be enjoyed during the fall. The mid-month of October until November is the only advisable time for visiting, to see the beautiful fall colors. The best display of the fall’s color can be captured at the rising of the sun and the Chinook pass, the paradise area, bench and snow lake, reflection lakes, the patriarchs. 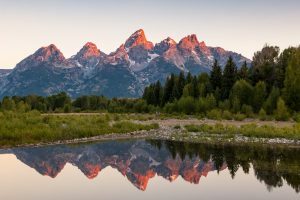 When the fall comes, the Grand Teton National Park becomes a spectacular location. Here, the orange and yellow (and sometimes red) leaves of the deciduous trees in the park, erupts with magical color in the fall. According to the National Park Service, the mid-month of September is when the fall colors of the park will probably reach its peak. The fall is quite an essential breeding season for the Deers in the park. 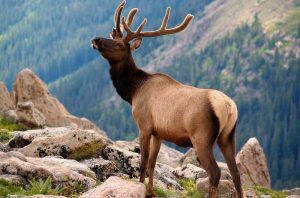 To attract the female, the male elk bugles by making an eerie cry that’s piercing, just to make their dominance known. There are times you can get lucky to witness a match any two dominant elk male. At the Rocky Mountain, the beautiful and bright blue sky, active wildlife, the occasional snow, spectacular color and its crisp air all together makes the fall the prime time to visit. Although, it’s still okay to visit the National Park without taking cognizance of the season. In late August, the aspen begins to turn in at places with higher elevation, while at the lower elevations, the golden colored leaves manifest in October. Right from mid-September until mid-October you get to hear the Elk bugling, and there are times that their bugling could be heard around late August and sometimes, late October. Wildlife lovers will also get to see the head-butting contest of Bighorn sheep. When it’s fall, visitors from various places around the world loves visiting the Shenandoah National Park. The mixture of red, bright gold and yellow color of the leaves at usually at its peak during the last mid weeks in October but for accurate information on the reports for fall color, it’s best you visit the website. 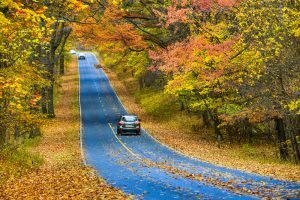 At the park, there is a National Scenic Byway which traverses about 105miles of the Shenandoah National Park and helps to view the spectacular foliage. At this park, you get to enjoy a supervised horseback ride, a hiking trail along with the beautiful colors of the fall and National Park’s annual bike festival, which holds every 16th-18th in October. The entire showy period for Pacific dogwoods, black oaks, large leaf maples, and some deciduous trees Begins in mid-October. The fall color is at its zenith in late October and usually lingers till the heavy frost or high winter begins around early December. 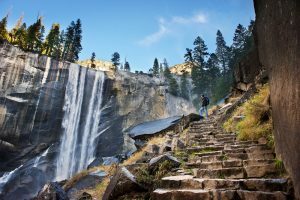 The Yosemite National Park reminds tourist or visitors that everywhere in the park is opened till October and maybe few days in November while the snow, may cause the park to close early. 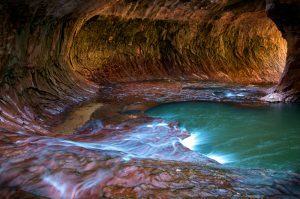 Zion National park encircles a huge elevation range and the fall season is the perfect time to visit the very first national park in Utah. Usually, the time the fall colors start is September, and that’s on the elevated part of the mountains, and it later extends to the lowlands in November. Tourist or visitors can be sure to experience a memorable scene of colors that comes with the fall. The Zion rocks tend to transform into a blazing golden red color when the sun rises and set. If you are a visitor or a tourist visiting Alaska during the fall, guess what! The Denali National Park is the place to be because its distinct wilderness and beauty are at its peak at its peak. Here, all visitors and tourists can enjoy the dynamic and elegant view mountains with the snow that’s covering them at the top and how the tundra blaze in fantastic reds. Though the activities and the services rendered are limited, but the experience is forever a memorable one. 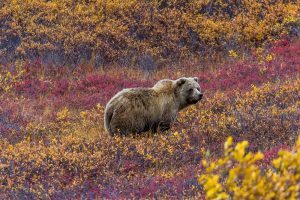 According to Denali National Park Service, the wildlife might be shedding off its winter’s deep-freezer so, enjoying every bit of fall before the return of winter is needed. The Cuyahoga Valley located in Ohio, the sugar maples are the indicator of the fall season. It goes off in orange, yellow, and red colors and it’s mostly along the park’s river banks. Red maples follow while the white oak’s leaves and the pin oak leaves change their russet color. After few days, the color seems to warm its route up the valley’s slopes in reds from the dogwoods, northern red-oaks, silver and black maple, the gum tree and so on. 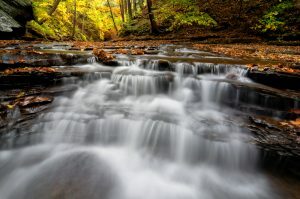 For an amazing and memorable experience, a walk along the towpath, which is along Erie and Ohio canals is advisable, and you can also decide to hike at the Brandywine Falls. If you are the type, who have been trying so hard to break free from the cycle of people doing the same old thing over and over again! 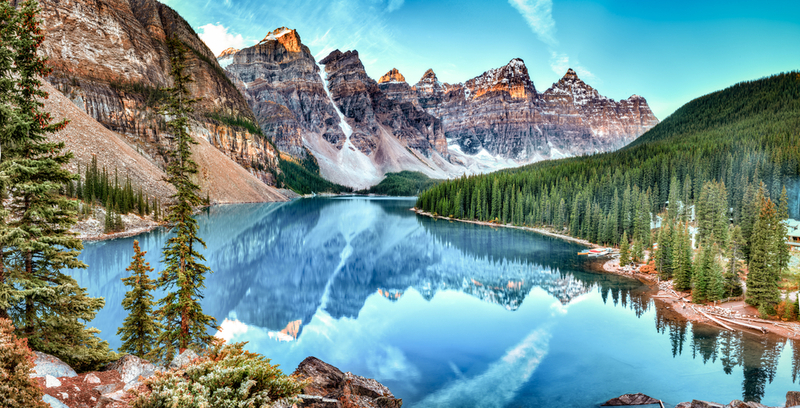 Listed and discussed above are the best and the most beautiful national parks you can visit this fall. With the information above, choosing the best and safest park to visit this fall have been made easier. So get up, drop those park’s photos and visit a park this fall!